You'll be centrally located in Ringkobing with a stay at Hotel Ringkjøbing, and 5 minutes by foot from Ringkobing Museum. Featured amenities include complimentary newspapers in the lobby, multilingual staff, and luggage storage. Free self parking is available onsite. Since 1663 Kongensbro Kro has been located where the highway between Aarhus and Viborg crosses the river Gudenå. 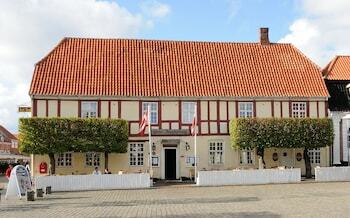 It is a modern inn with up-to-date rooms, a view of the inns garden and the Gudenå. With a stay at Aarhus Hostel in Aarhus, you'll be within a 15-minute drive of NRGi Arena and NRGi Park. The front desk is staffed during limited hours. Free self parking is available onsite. With a stay at Havgaarden Badehotel in Vejby, you'll be by the sea, just steps from Zealand and a 4-minute drive from Tisvildeleje Beach. Free self parking is available onsite.